(As part of Reverse Order Bowie). I’ve finally rekindling the task I set myself last year. 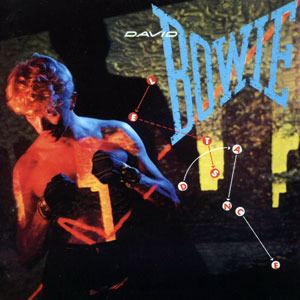 Few devoted Bowie fans EVER rate this album or admit to liking it. Yes, it’s commercial. Yes, it can be argued as a result Bowie “sold out”, but that doesn’t detract from it being a good album in my eyes. Yes, it’s quite low on my list being 8th from bottom, but that is due to there being such stiff competition with what’s to come. The albums to come (on my list) are not only some of Bowie’s best, but the best albums of all music artists and genres! It actually ended up this low on my list purely because all the albums that will be after it HAD to be where they are. Anyway, it’s get down to brass tacks. It’s a funky piece. I love the heaviness of the drums. Tony Thompson and Omar Hakim are/were (sadly TT is no longer with us) two of the best drummers ever to pick up sticks. And Nile Rodgers’ co-production adds to the funk of the album. There’s some cheese on it. My partner HATES Modern Love, but I don’t mind it. It was probably the first David Bowie song I actually remember liking with my own personal taste (IE: no influences of what I should or shouldn’t like as a Bowie fan – and not being actively *IN* Bowie fandom yet). I’m not THAT gone on it now, but I can certainly listen to it without being repulsed (unlike my partner). Without You is pure cheese and 80s ballad schmaltz. I prefer the second side of the album (second HALF for the digital savvy). There’s politics in Ricochet – although Bowie’s little spoken segues make me wonder “is he doing Welsh? Yorkshire? What *is* that accent?”. Petty, I know. Even Shake It, which is still on the cheese side – I like for nothing else than just for the line “you’e better than money”! It’s funky. It rocks. It’s got great drums. I still like it. It’s not on CONSTANT rotation, but I do go back to it from time to time. Especially when in a “commercial 80s pop” mood. Bowie “puritans” who hate it can go kiss my chuddies!